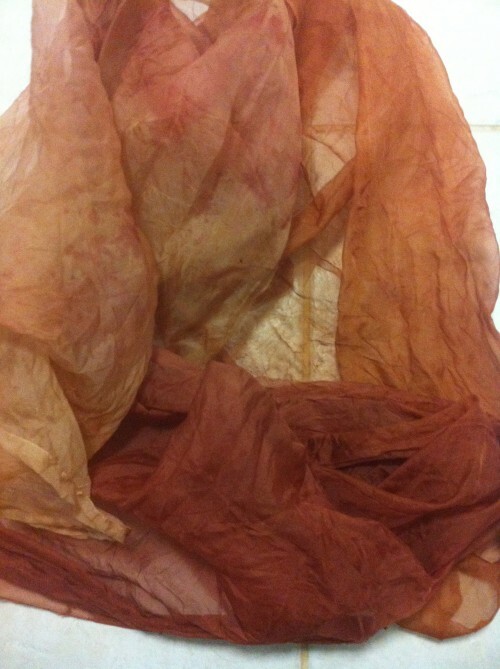 I just felt like dyeing some fabric! I found a largish quantity of frozen avocado pips in my freeze, boiled them up in water and then blitzed them in a food processor until a paste formed. Frozen avocado pips go into the pan with water. 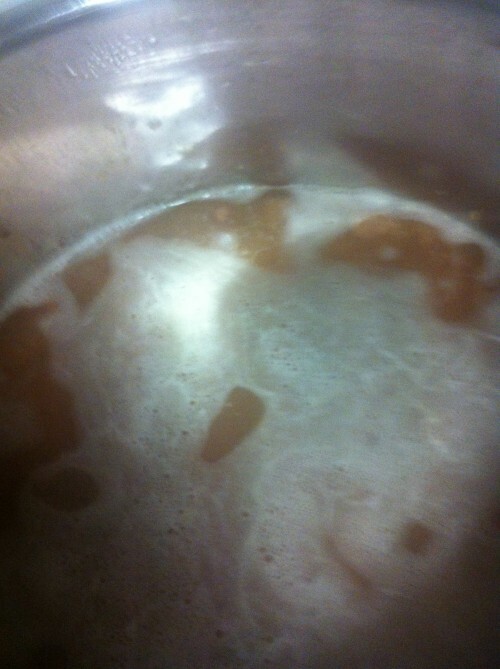 I simmered that for a while longer then added a 1.5 m length of 2 ply Cambodian handwoven silk to the bath. The silk came from http://www.pollarddesigns.com. 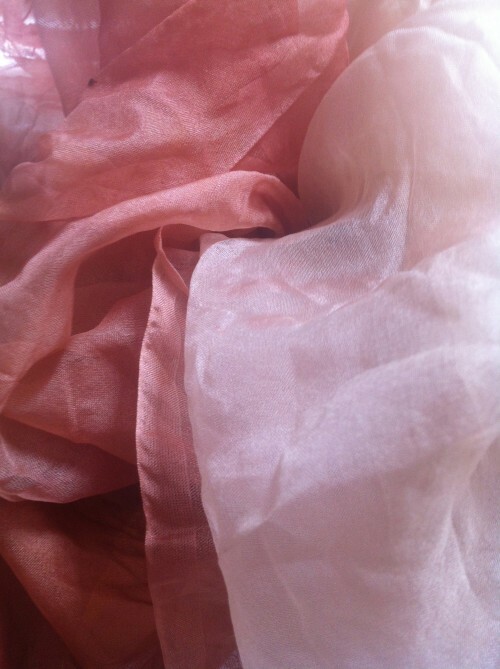 At the end of this phase I had a large piece of quite pale , peach -coloured fabric. 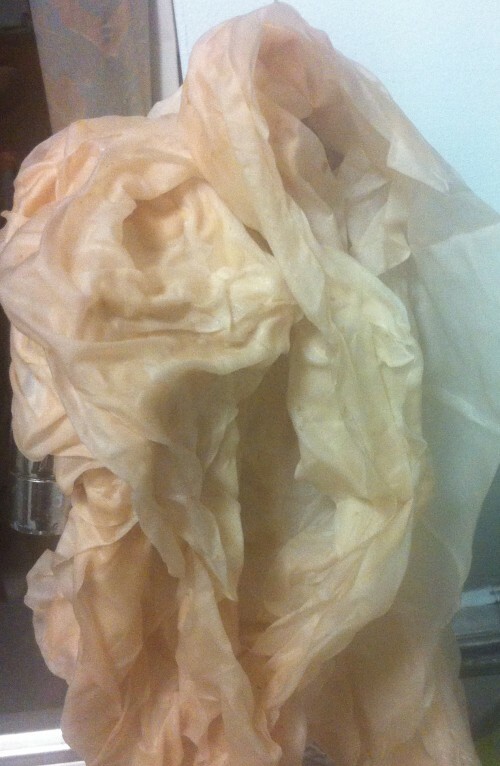 Whole piece of fabric as it came out of first bath. After drying the piece on the clothesline overnight (without washing) I ripped it into three roughly equal sized pieces. I strained the paste through a stocking, discarding the bulky residue into the compost bin and returning the filtered solution to the pan. To test post-mordanting, I put one segment of the dry fabric into a soda ask solution ; one into a white vinegar solution; and left the last dry. Soaking time was about 30 minutes. There was a startling change in the soda soaked piece. Each piece was again dried and returned to the dye bath. The soda soaked piece retained and perhaps even deepened its colour.The vinegar bathed piece and the piece receiving no treatment appeared the same colour as each other and as they had before. After second simmer and drying. However, I then put all the pieces into the soda ash bucket. All changed colour to a darker red, with the previously darkest one remaining sightly darker than its now darkened mates. 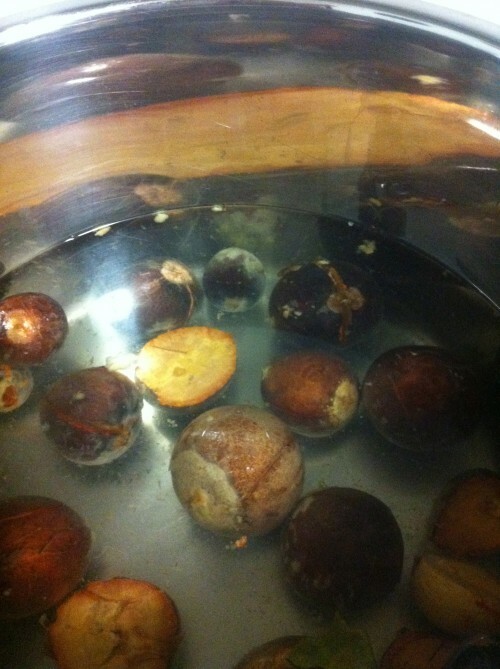 This is a picture of them after drying but before washing. Fabric after rinsing in soda ash solution, after drying, and before washing. And this is what they looked like after washing in warm Lux Flakes. There was very little to negligible colour in the washing water after this process. Finally, here it is after washing and drying. Now I’ll have to think of the next step! Silk pieces after final wash and drying. Still slightly different shades because of the various post-mordanting treatments. Love those colours Margaret. 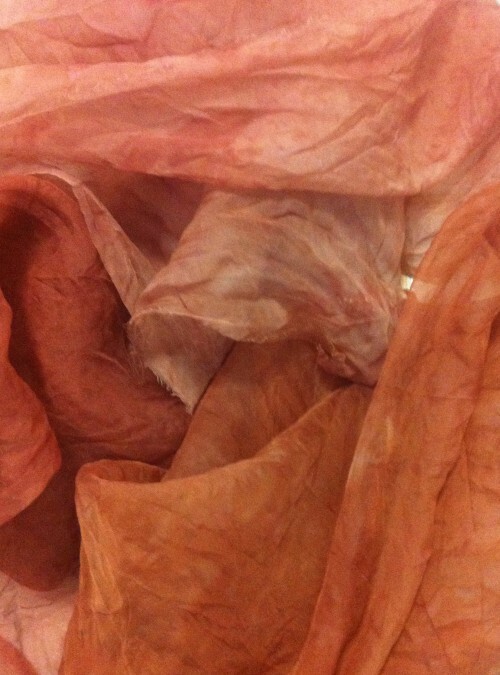 Next step might be light fastness testing….. or Sun dyeing perhaps.